2017 starts off with lots of new products for the world of wood flooring. Domotex in Hanover and IMM Cologne, two of the most important events for enthusiasts and industry professionals, demonstrate the great versatility of parquet, presented this year in many variants, all ready to set the next trends. Experiencing a recovery since 2015, as stated during the annual assembly of FEP (European Federation of the Parquet Industry), parquet remains a timeless solution for use in interiors and exteriors, thanks to its high level of technical and aesthetic qualities. While the focus of the past seasons was on “new” materials like cork and bamboo, in the coming weeks we can expect an increasingly creative use of wood, even in its more traditional species. Here’s what we discovered in the booths of the two German fairs, where we observed all the 2017 parquet trends, previewed here for you. On the scene for some years now, the vintage effect confirms its presence among the trends for 2017: whether aged wood or actual reclaimed flooring, this seems to be a truly timeless trend. Indeed, distressed parquet is one of the most sought-after treatments for home and business environments, providing a shabby chic flair that goes well with an informal yet refined style. There are numerous alternatives for lovers of the “lived-in” look, who will be able to indulge in new parquet floors that are distressed to look like they have already been used. Not to mention do-it-yourself solutions like hand-stripping, to remove some layers of paint and create evocative “raw” effects. And for those who simply cannot resist the wear and tear of history, there is an increasing number of offers for reclaimed and reused wood. Whether parquet from old homes or old beams bent to use, the important thing is that the wood retains all its retro flavour. In line with the now widespread culture of recovery, which has long been present in furnishings and interior design (who has not seen the appeal of a pallet lately? 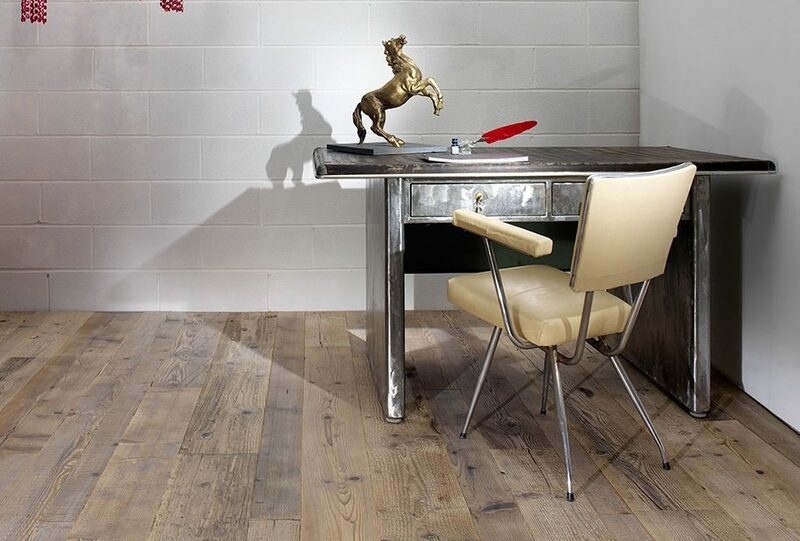 ), wood can therefore live a third life as we can see in the products of the Pratovecchio Line of Idee&parquet. Reclaimed wood from beams, barrels and dolphins, carefully selected and crafted by experienced craftsmen, convey all the allure of their history, providing new ambience and emotions in every room. Have you ever thought of a masterpiece for a floor, perhaps a limited edition or even a one off? Among the parquet trends for 2017 this is also now an option: parquet as an actual medium for artistic drawings and expressions. Engravings, applications, prints… whatever strikes the fancy of bold home owners and designers. While last year we witnessed an important revival of wallpaper, presented in many different more or less delicate looks, this year it is the floor in the spotlight with unique decorations and treatments. For example, a wow effect is guaranteed by permanent markers that trace the joints, creating 3D-like geometries capable of attenuating any environment. More sophisticated, on the other hand, is the style offered by the numerous inlay solutions. Of course everything depends on the pattern, but there are many possibilities for customisation: just think about the refined appeal of an engraving filled with precious brass inserts. If neither the watermark version nor the tattoo effect appeal to you, there is a third solution. In addition to these very graphic designs, this year an old classic is trending once again: the herringbone pattern. Very common in private homes starting in the 20th century, the herringbone is available in both Italian and Hungarian cuts. The strips of different lengths in the two styles are placed at 45° angles to each other, with the difference that in the Italian version the end of one is in contact with the side of another, while for the Hungarian version the two ends touch. Whatever your preference, our suggestion is to let yourself be tempted by a good classic that is never out of fashion. And for a truly tailor-made parquet, why not try a different cut? 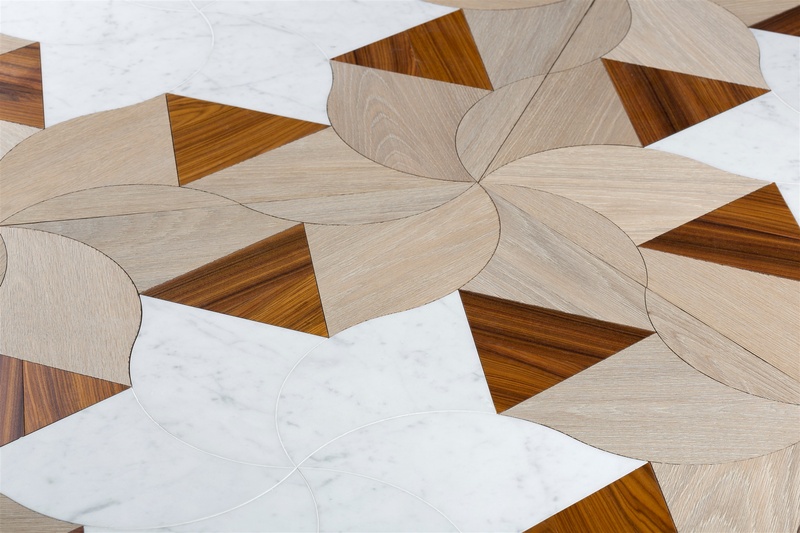 Among the many variations of shape this year, we particularly like the square or hexagonal shapes, such as the Gazzotti My Vintage line that features square modules of different sizes for every installation need, or the Idee&Parquet Chimera line with hexagons broken into 3 or even 9 pieces to create interesting floor geometries. It is well known that there is strength in numbers. And this is also true for flooring where the combination of parquet and other materials adds a touch of extra personality, making each room unique. One of the trends returning this year is certainly the always-elegant pairing of wood and marble, or the more rustic but very effective with ceramic or stone. Until a few years ago there was an unwritten rule: “no parquet in the bathroom or in the kitchen”. The moisture and possible sources of disturbance produced in both rooms made them off-limits for wooden floors. And so we often found ourselves with different floors in each room, or almost: sleeping areas in one way and living areas in another. Today, however, not only can you bring the parquet floor all the way to the sink, but the new trend is to put wood directly in contact with other materials to break up the continuity of the floor in a fun way. This makes it possible to delimit different areas in the same room. For example, why not define the sofa area with parquet, leaving the rest of the room with marble or coloured tiles? For some time now, parquet has become a playful element that interacts lightly and effectively with all the other floorings. One of the more popular new developments is the combination of parquet and resin. Very adaptable and promising, resin is an apparently simple material but with great aesthetic potential. Try it in combination with matt parquet to bring out its shiny qualities and give the room a modern and cosy look. Have you already tried one or more of these parquet trends? If you have, come back and visit us to see the other 2017 parquet trends. If not, please contact us: we’ll be happy to explore them with you.